It had been a challenging few weeks - the seasonal sickness that descends on all those condemned to office life had struck and left us tired and exasperated. To cap this, of all the body parts which could choose to exact sympathetic rebellion, my right foot was painful. I'd spent the last week of spasmodic coughing and sneezing poring over maps of Essex and I just couldn't find an easy way of advancing along the A13 - the walk was either too short to be interesting, or far too long for my current condition. Meanwhile, the day crept up on me strangely quickly. Rather unexpectedly though, a reserve plan sprang into being. I'm not sure how, or why I found myself idly looking over the OS Map of the Lee Valley - but it struck me it was time to return to the river I'd spent so much time mythologising over the last few years. I planned hastily: I'd walk into London rather than out, taking advantage of the parallel railways which flank the Lea Valley to make my escape if my range was limited by fatigue or foot-rot, and I'd start outside the M25. It made for a good long walk which symbolically cut another axis into that great circuit. The day dawned surprisingly fortuitously for a walk. The weather was perfect for walking, with blue skies flecked with cloud and a cool breeze. My foot too, appeared to have relented and healed somewhat. I tested my boots and found that they were far more comfortable than regular footwear had been. The journey to London was a relaxing, quiet pause - the first in a few busy weeks and I stalked off for the tube at Paddington in good spirits. A quick spin around the Circle to Liverpool Street, and then armed with coffee, onto a suburban service out into Hertfordshire. Rebranded as TfL Rail, the Overground Orange motif spattered across the decor, with a freight of spaced out kids nodding and sputtering home from a Friday night in the clubs. Over the rooftops of Bethnal Green and Hackney, then into the strange suburban hinterland which breaks like a spent wave on the western side of the Lea Valley. The Turkey Brook, passing under the line deep below signalled that it was almost time to alight, and to begin walking. I was briefly disoriented on exiting the station - blinking at my map in the sunshine, I soon spied Trinity Lane heading off between ranks of suburban houses. The lure of possible supplies on the High Street was strong, but I had the urge to start walking. The surprisingly warm morning was wearing on, and I was still a little concerned about my walking speed and endurance despite having a pretty solid escape plan. In truth I didn't want to have to abandon a walk - it just wouldn't feel right. Immediately on entering the lane I realised I was walking a watercourse already. Sandwiched between the houses on my right and the road was a deep ditch, bridged by driveways into the pleasant looking suburban dwellings. Theobald's Brook, having emerged from under the road junction at the station, was leading me to the river. Being hazy on an exact route, I decided to follow Trinity Lane into the Lee Valley Country Park with the brook as my guide. Eventually the road dwindled to a lane leading to a level crossing over the railway from Cheshunt, and after a careful crossing I found myself in the park at last. The brook swerved away to join the Small River Lea, while the path opened into a vast greensward dwarfed by pylons. I recalled being taught as a small boy that electricity and water don't mix well - but here in the Lea Valley they are constant companions. Pressing on into the park I crossed the Lee Navigation near the Lee Valley White Water Centre, complete with its plaques bearing witness to Olympic renewal. The path rose here, with a good view along the quiet, emerald waters of the Navigation. There was a distant hum of traffic and a buzzing of insects. I was back in the valley, and glad to be here. But the walk is pleasant. I'm not really hitting my usual pace - I'm just enjoying the cool of the river breeze and the sun on my face. It feels like a long time since I walked in sunshine. The rivers stay close here, as the shudder of motorway traffic begins to make itself heard. There is no great ceremony here, no arcing bridge. Instead a low, concrete bridge spans the collected rivers, the traffic just feet from my face as it shrills by. The road is flowing faster than the water, a lane of large lorries obscuring the sun before I reach the bridge. It's cool in the shade, and the slope under the pillars opens into a muddy lake of litter. A recently dumped, not yet torched Peugeot 206 awaits its fate beside a pile of clothes and soft-furnishings. It is surprisingly intact, and appears to have been driven here. The thought of off-roading across the marshes is absurd. Beyond the plain of waste, I spot a gateway leading up a rise and away from the river. I'm reluctant to leave the path - but I'm drawn to the light after being under the bridge. It's a slick, grassy scramble up the muddy slope on the edge of Rammey Marsh with just occasional tufts of coarse grass to aim a boot at - but I'm rewarded with a chance to be at close quarters with the M25 in a way I'd never quite expected. 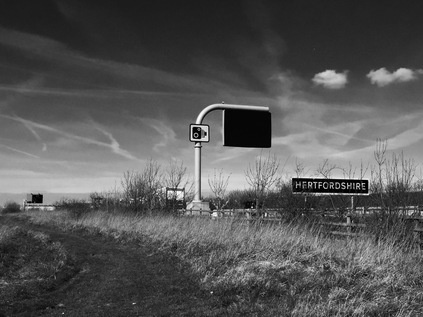 A huge Variable Message Sign curves over the carriageway nearby, and a bold blue board marks the border in capital fashion: HERTFORDSHIRE. As traffic shudders by, little more than pale streaks of colour and rushes of air, the infrastructure broods silently. The scale of the bridge, the towering pylons forming a lattice of wires across the road, the massive hulk of the signs - it is strangely awe-inspiring up close, out of the mediated frame of a windscreen. I paused here for quite a while, just watching the road while contrails crossed the sky. Here - for perhaps the only time on my walk - water wasn't the dominant force. Scrambling back down the bank was more complicated and less dignified than the ascent, but I was soon back on the path and heading south. The river runs in three channels here - the Navigation and Diversion parting to envelop Enfield Island Village, with the Cattlegate Flood Relief Channel skirting the eastern fringes of the valley. I confess to being lost in the terminology here - ill-prepared for the complexities of the waterways I'm trying my best just to stay on course. But the lure of refreshment is too strong, and I climb the steps onto the bridge which leads into the former Royal Small Arms Factory. Inside the water-bounded compound it's a mix of old and new - long, low brick buildings which date from the island's former occupation rub gables with new housing stock, built in similar but slightly off-key styles. The overall affect is jarring and oddly creepy. There are few people around until I get to the tiny and ill-organised Tesco Express store - the only amenity here which is in business. I head back to the river with my purchases in hand. It's dusty and dry here, work still going on to build more housing on the southern edge of the site. I recall the tales of toxic dust when the main area was upturned and built on, and I try not to breathe until I'm safely in the shade of Swan and Pike Pool. I rest beside the water while across the cluttered, dirty pond someone does yoga silently. It feels calm and restful enough here - but that seems such an unlikely pursuit so close to the heavily polluted motorway air. The valley changes character as I set off again. Turning south where the huge Enfield Energy plant dominates the view, the Navigation is a broad, straight canal. Right away we're joined from the west by a confluence of the Small Lea and the Turkey Brook, running in at a reedy, inauspicious junction. The Navigation's other sister streams have parted from us, running along the eastern edge of the valley and now separated by the vast hourglass-shaped expanse of the Chingford Reservoirs. The most northerly is the King George's Reservoir, with steeply raked grass banks separating countless millions of gallons of water from the rivers. This was, until 1951 an aerodrome. This flat, empty situation on the valley floor proved perfect for these experiments in watering a vast urban metropolis. A similar undertaking would almost never succeed now, risking strangulation by the twin hands of planning regulation and protest movement. The challenge of holding back such vast volumes without slippage and disaster resulted in a long-standing British dominance of the soil dynamics field. The towpath continues, skirting the minor kinks in the southerly course of the Navigation. An overflow channel leaves the canal, a concrete culvert full of mud and silt, hugging the perimeter of the artificial lake as a causeway carrying the A110 separates it from the William Girling Reservoir. The causeway is a passage from pub to pub - from Nags Head Road to Kings Head Hill, taverns celebrated along a route marking one of the few horizontal crossings of the odd, somewhat beleaguered valley. This lake - named for the chairman of the Metropolitan Water Board at the time of inauguration - is more elegantly tapered than its northern counterpart, the southern reaches pinched by the rising flanks of land which support Chingford and Tottenham. 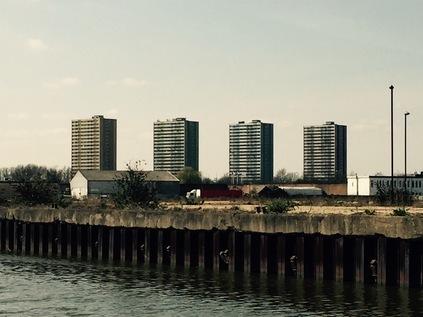 Looking west, a rank of four tower blocks at Ponders End dominate the horizon, rudely emphasised by the empty industrial lots between the river and the housing estates of Brimsdown and Edmonton. South of here, the western bank is dominated by the Lee Valley Athletics Centre - a pale shadow of what was meant to be the pre-Olympic dream: a revitalisation of the valley through sport has always been the officially preferred mechanism. At Pickett's Lock a crumbling boathouse is sheltering three preening swans, the plans for the 2005 World Athletic Championships long forgotten and eclipsed by the great events of 2012. The embarrassment of earmarking a site which was too difficult to reach and too expensive to develop is almost erased by later profligacy, by a project just too big to fail. There is a golf course now, man-made lakes, a sports centre to replace the original Pickett's Lock centre. But thankfully the river still runs undisturbed. The sun is riding high now and my forehead is starting to sting where I'm sweating. I fear I may be turning pink. I see virtually no-one on the path now except for the river-dwellers working on their boats and the occasional jogger. Most sane Englishmen are safely indoors, even though the April sun lacks the power of summer. I walk on. Almost hypnotised by the long, yellow stone path stretching ahead, I'm surprised to hear the sound of traffic returning. The path opens into a vast stone chamber under the junction where the North Circular meets the Ravenside Retail Park. The complex web of slip-roads spans the entire valley, with a roundabout dominating the dormant space between the Lea and its navigable stream. As I pass under I instinctively turn to photograph daylight above me, penned in between the carriageways. I press the shutter as two huge birds spread their wings and head for the sky between the slip roads. Meanwhile a rowing boat filled with laughing Sea Cadets lurches and splashes under the A406. I'm inside the City's inner road necklace now - and any sense of rurality disappears. The walkway is narrow, a metal crash-barrier separating it from the dusty, unadopted mess of Towpath Road - existing only to serve a complicated jumble of businesses and the Arriva Edmonton Bus Depot, forced into the dwindling neck of land between the rivers. Dust rises from the passing buses, obscuring what appears to be an illicit trade in waste white goods. I'm pressed against the barrier for fear of cyclists who don't ring bells here. Thankfully, the River Lea soon rejoins and I'm on a thin spit of land between two wide, slow streams of water. The rank of pylons which have shadowed my route here from Waltham Cross have split, flanking the channel on both sides, placing me in an eerie procession. A genuinely electric avenue. A glance at the map shows an explosion of water here - the bulging circle of Banbury Reservoir is the last of the Chingford Chain, with the Walthamstow waters taking over the valley. I'll see less of these - they favour the eastern side of the Lea Valley, with only the Lockwood Reservoir sidling up against the River before I leave the valley. This last stretch is hard going. It's been a hotter, slower walk than I'd expected and despite being mesmerised by the strange vistas of the valley, I'm tiring. 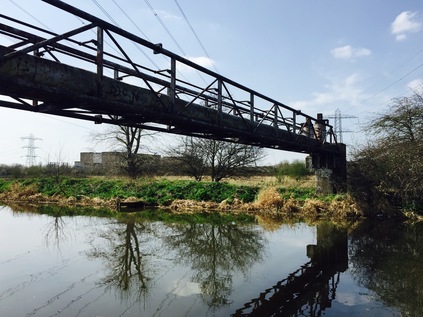 A curving footbridge gives access to Tottenham Marshes and a series of well-used green links along the edge of Pymmes Brook. The afternoon is cooling a little, but the sun remains high - and couples push strollers and wander the path. The eastern bank is quieter until Stonebridge Lock where the only option is to cross the gates and join civilisation. The former café and toilet block is a focus for walkers - a place to reevaluate their limited post-prandial stamina and turn back before it's too late. Before they are walking the valley like me. I spot an entire family on a bench near the lock gates, the elder gazing down at the end of his walking stick. When I resurface from using the facilities they have crossed the lock and assumed an identical position on the western bank. My ceremonial guides as I embark on the last leg of my walk for today. The Navigation is busy between here and Tottenham Lock - the waterway filled with boats in various states of repair, from semi-sunken to beautifully decorated, and the footpath busy with walkers and cyclists. An alarmingly drunk man mis-steps toward the water, a passing family oscillating between concern and distaste. When I pass him he's facing inland and fumbling with his flies, smiling blissfully to himself. Saved again by instincts which defy his inebriation. Despite knowing how close I was to my goal, Tottenham Lock came upon me unexpectedly. The gentle curve of Ferry Lane bridge and the strange oblique sculpture which sits beside it appeared in negative due to the glare of the sun - which now also bounced back at me from a range of tall apartments built since my visit in 2012. 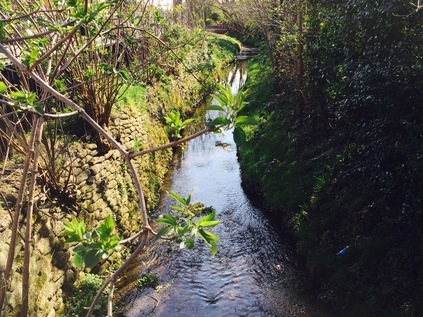 Pymmes Brook was now alongside me too - a stinking ditch in a divided concrete chasm, chasing its final few metres before being subsumed into the broader waters of the Lea. At Ferry Lane I resurfaced and crossed the road to survey the spot I'd left the river three summers ago. Aside from the near-completion of the vast development behind me, little enough had changed. But for me - everything had. I'd always anticipated picking up this walk in a northerly direction, heading away from the City and the repellent enforced buoyancy of the Olympic summer. Life took a different turn, and it seemed fitting to be coming back to civilisation, part of something bigger and more human from an entirely different angle. The last few steps to the platform at Tottenham Hale were as painful and frustrating as last time. There is no access to the station from the east, no one walking in from the lakes. It felt strange to be coasting across the wide expanse of green marshland near Clapton, after spending a day surrounded almost entirely by the waters of the Lea Valley and I realised I was catching probably my first glimpse of the familiar city skyline today as I headed back towards Liverpool Street. The wide swathe of water continues, paralleling the railway line - and I know that I'll need to return to walk the eastern reaches if I'm to fully understand this remarkable and confusing place.